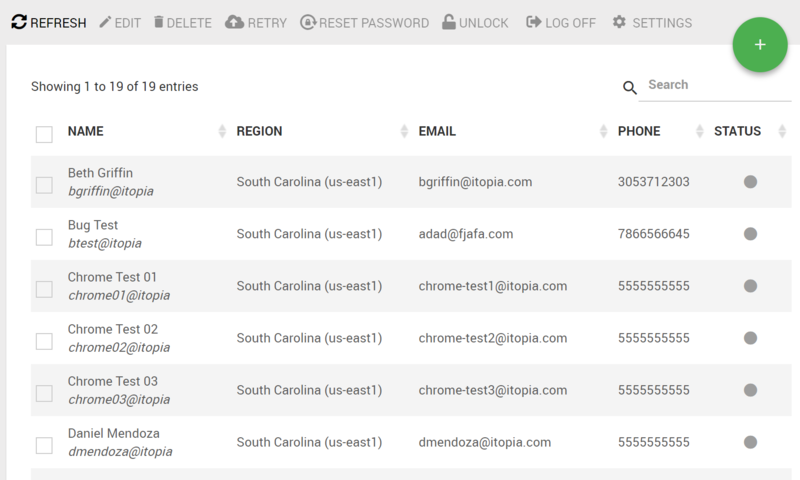 Manage your users in itopia. This article explains basic functions available in Users module. After your deployment is on cloud you can click the green + sign on the top right corner of users module under Cloud Desktop section to add a new user. Once the user is created, you as admin will get an email with the credentials and instructions how to download the RDP file to connect to cloud with user account. You can also create several users at once. For bulk user creation there are several other ways to import users to itopia CAS so they can be sent to cloud and virtual desktops can be created for them. One way of importing users is the Discovery tool that gets details of every user that ran PC Discovery and saves user's email, department and phone number saving the time you'd normally spend collecting/ inputting this information manually. Select the deployment first from the main menu in the top left and continue to Users under Cloud Desktop section. You'll get the overview of all the users' details. You can see in the Status column if the user is connected (green status with the server name), logged out (gray status) or pending creation (orange status). Hovering your mouse over the status you can see more details, like when was user connected for the last time. Clicking on user's name you will get user's settings detail. You can even manage Security Groups and Applications for them. When editing a user, check the box next to user's name and select the task from the main menu. When deleting user from itopia CAS, the system deletes user's UPD as well. For extended AD deployments, the user is deleted from the extended AD in the cloud as well as from the on premise AD. To create new user go to the Users module and click on the green + sign in the top right. 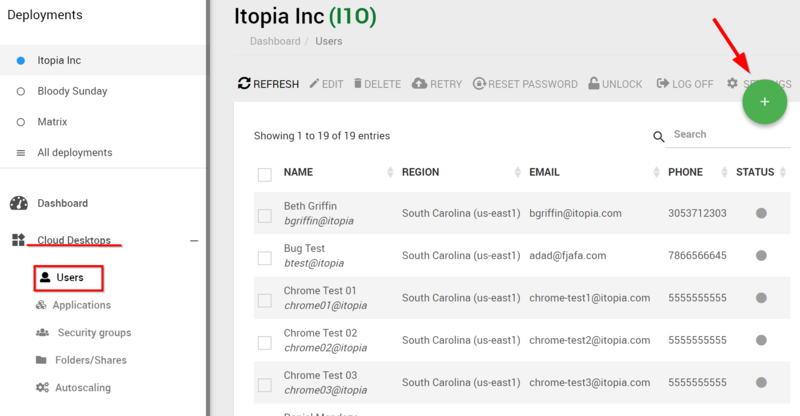 Making organizational changes to the users directly in Active Directory may affect the itopia integration with Google and management functionality from the itopia portal. Please confirm with support before making such changes. We'd love to hear from you! Feel free to contact us with questions or feedback!